Venue: All talks take place at the UNITE Building, University of KwaZulu-Natal. This opening discussion will address Africa’s impact on all things artificial intelligence. While many like panels tend to go with “AI in Africa” or “How can we grow machine learning in Africa”, we thought we would make Africa the defining term, to indicate that Africa has the control over AI. This also serves our narrative for the discussion: focusing on AI and its complexities from our African perspectives rather than Africa from an AI perspective. We welcome a diverse and experienced group of people to introduce what AI means to them and how it is influencing our world. This includes some of our amazing speakers who will be joined by Prof. Francesco Petruccione, the Pro-Vice Chancellor of Big Data and Informatics at UKZN, and Sicelukwanda Zwane, who is an MSc candidate with the CSIR at Wits focusing on the intersection of robotics and machine learning. Christopher Currin (PhD Computational Neuroscience at UCT) will be facilitating the panel to guide the conversation from introduction to impact. A Hackathon will run on the 16 and 17 of April. Hosted in the LAN and Rooms 1, 2 and 3. Indaba?? 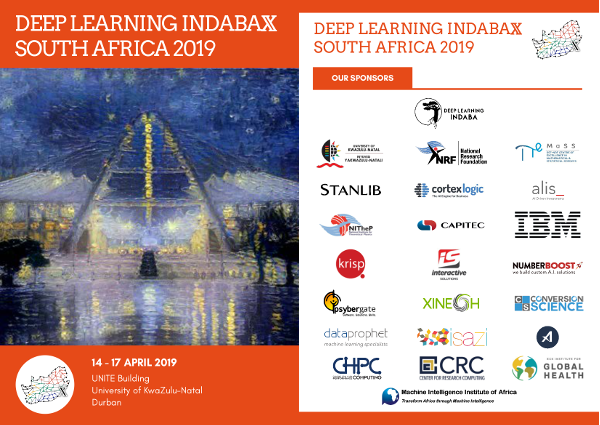 events are local versions of the Deep Learning Indaba, which will be held this year in Nairobi, Kenya.